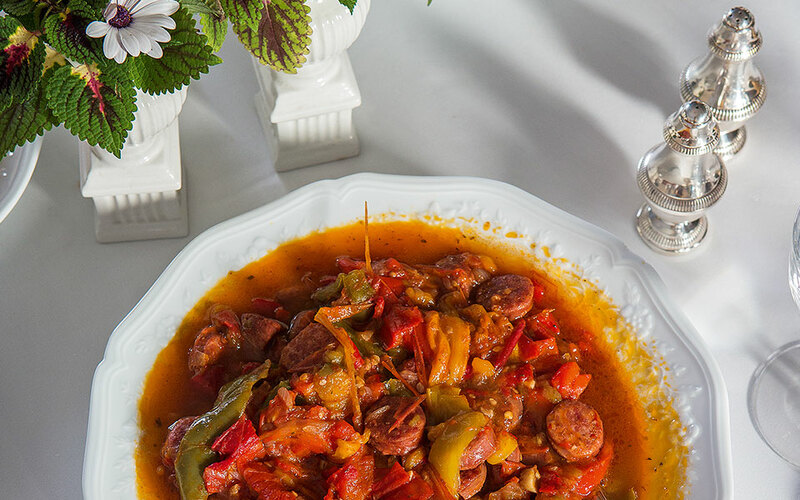 Sausage and peppers in tomato sauce is a dish commonly served in Pilio and pairs well with fiery tsipouro. Emblematic of Pilio's meze-oriented cuisine with flavorful dishes that pair well with tsipouro, this sausage, pepper and tomato dish is also easy to make. In a large frying pan, cook the peppers over medium heat in 1 1/2cm of olive oil for around 6-7 minutes, until golden. Remove with a slotted spoon and drain excess fat using a paper towel. Place the sausage slices in the pan and sauté lightly, without letting them turn brown, and then remove from heat. In a separate pan (a deep frying pan or wide saucepan), simmer the tomato together with the tomato paste in 2 tbsp of olive oil until it reduces by half and then add in the peppers and the sausage. Cook until the sauce thickens to a creamy texture. Season with salt and pepper and serve with thick slices of rustic bread.